China’s Three Gorges dam, completed in 2006 and put into use last summer, is the world’s largest source of ‘clean’ hydroelectric power. With a generating capability equal to that of 15 nuclear reactors, the project has been hailed as a solution to China’s massive energy crisis. However, before the project had even been completed, major concerns were voiced over the potentially disastrous environmental repercussions of this massive engineering project. 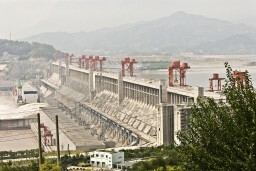 Seven years later, the Three Georges dam appears to be China’s greatest short-sighted decision in its era of modernization and industrial development. The dam has certainly been a crucial element of China’s ‘green’ initiative, aimed at decreasing reliance on non-renewable sources of energy, in particular, coal. However a decrease in carbon emissions does not necessarily create an environmentally friendly energy strategy – for example, the use of the colossal reservoir had led to weakening of the river banks, causing massive landslides in populated areas. And these are just the beginnings of the problems. The creation of the dam has slowed the normally quick flowing river, causing silt in the water to settle on the riverbed. This not only decreases the concentration of nutrients in the water, but damages existing ecosystems. Stagnant water in the reservoir could also boost pollution levels and water-borne diseases; already major issues for the population in the area. While constructing the dam, the Chinese government moved an estimated 1.3 million people from their ancestral homeland along the river valley. As the reservoir continues to weaken the riverbank, erosion is expected to displace another 100, 000 people. Decreased level of silt downriver of the dam may lead to poorer agricultural yields , with important nutrients settling to the bottom of the reservoir. Perhaps the most frightening possible consequences of the reservoir is an increase in earthquakes. Geologists fear that the weight of the reservoir may actually cause seismic activity over the two major fault lines that the dam rests on. In addition, vulnerability of China’s already endangered species is increasing, as huge amounts of water are moved around the watershed. Many fragile ecosystems have been destroyed when water levels have changed dramatically. Wetlands, home to many unique species, are especially susceptible to changes in the river – populations of species such as the Baiji dolphin, Chinese sturgeon, and the Siberian crane are endangered because of the Three Gorges dam project. The Three Gorges Dam shows with brutal clarity, that China traded short-term gains for long-term social and ecological problems. The energy gained by this project is not clean, and it will have long-lasting effects on a waterway that runs through over half of the country. The environmental effects of this dam will be long-term, and in most cases, irreversible. Now that the Three Gorges Dam is in full use, these environmental problems will have to be solved rather than prevented. The world’s largest ‘clean energy’ project has already caused and will continue to cause permanent geological and ecological damage.